Dr. Lauren is excited to work with the HousePaws team after practicing veterinary medicine In the South Jersey area for over 12 years. She was born, raised in Hammonton, NJ. She can’t remember ever wanting to be anything but a veterinarian. 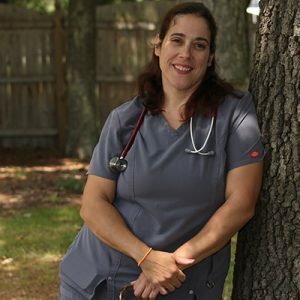 Dr. Lauren achieved her goal by obtaining her DVM degree from Iowa State University in 2000 after graduating Cook College, Rutgers University in 1996. She spent summers as a veterinary technician, a pharmacy technician at the vet school and as a vet assistant/farm laborer on a Michigan pig farm. She had the unique opportunity to pursue her passion in alternative medicine and study acupuncture at Beijing University , China during her senior year of veterinary school. Her professional interests include dermatology, behavior and integrative medicine incorporating eastern and western medicine philosophies and therapies. Dr. Lauren spends most of her spare time chasing her young boys Tony and Danny and maintaining the house she shares with her husband, Alan, and a father in law, 7 cats and 2 senior mixed breed dogs. She loves to dance especially West Coast Swing. She travels the country looking for a great dance and a great meal when the boys allow it. She is so excited to finally treat the whole patient in their relaxed home environment and truly bond with the pet and the people that love them.